He wouldn't confirm it's Rihanna in the now famous photo, but LAPD Chief William Bratton said that anyone involved in leaking it could face felony conspiracy charges. Rihanna broke her silence on Friday, her 21st birthday, by releasing a statement through Rubenstein Associates that said she was "doing well," but would not discuss what happened the night Chris Brown allegedly assaulted her. "At the request of the authorities, Rihanna is not commenting about the incident involving Chris Brown," the statement read. "She wants to assure her fans that she remains strong, is doing well, and deeply appreciates the outpouring of support she has received during this difficult time." The singer canceled a planned birthday bash in New York and postponed concerts overseas in the days following the incident. 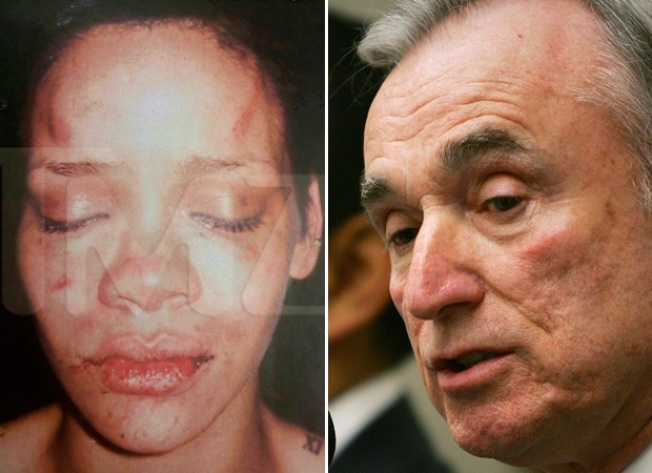 Meanwhile, L.A.'s top cop, William Bratton, is pondering the source -- and legal ramifications -- of the shocking photo of what appears to be a battered Rihanna. When TMZ originally posted the photo Thursday night it said nothing about how it was obtained, saying only that it was taken after the alleged fight between Rihanna and her presumably ex-boyfriend, fellow pop star Chris Brown. LAPD's Chief William Bratton acknowledged Friday that the photo could be an embarrassment for the woman depicted and added that the leak may have been "a felony violation punishable by up to three years in prison." Bratton told reporters that along with launching an internal investigation into whether the photo is police evidence, he is also looking into how TMZ obtained the picture. He said the department may pursue a felony conspiracy case against TMZ and whomever might have helped them get the image. Bratton neglected to confirm that the woman in the photo was in fact Rihanna. Meanwhile, others saw a teaching moment in the welts and marks on the face of the woman in the photo. "If it could happen to Rihanna, it could happen to anyone," said Kim Gandy, president of the National Organization for Women. There are an estimated 4.8 million domestic violence attacks on women and another 2.9 million attacks on men each year, according to the National Center for Injury Prevention and Control. "Maybe it is a good idea if it's her, if young girls see this," said Susan Murphy-Milano, a Chicago author and advocate for battered women. She said she hopes it makes them think, "Is the next picture going to be of her in a morgue?"